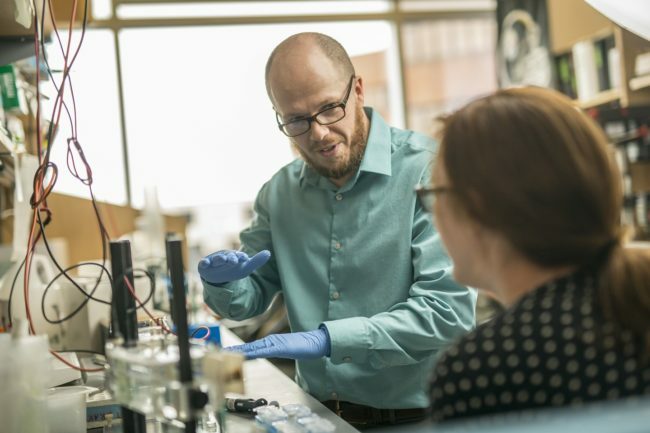 The larger grant to Associate Professor of Biomedical Engineering David Merryman – the result of one of only six winning R35 Emerging Investigator Award applications to the National Heart, Lung and Blood Institute so far – provides $5.3 million over seven years. It also funds his work in developing heart valves that may one day be able to grow along with children. But Merryman said some of his most promising work in the fight against deadly heart disease lies in the study of Cadherin-11 (CDH-11), a protein that acts as an adhesive between fibroblast cells. It manifests after myocardial infarction and in heart valve disease, gradually stiffening the tissue in a process called fibrosis that leads to calcification in the valves and heart failure. About 735,000 Americans per year suffer heart attacks, and those plus all other varieties of heart disease are the No. 1 killers in America. Merryman is collaborating with a host of School of Medicine researchers: Dr. Scott Baldwin, Katrina Overall McDonald Chair, professor of pediatrics and Division of Cardiology director; Dr. Thomas Force, professor of cardiology and director of cardiovascular research; Dr. Joseph Fredi, assistant professor of cardiology; Susan Majka, associate professor of medicine; and James West, associate professor of medicine. The lab’s work with CDH-11 dates back to some of Merryman’s first Ph.D. students: Joshua Hutcheson, who went on to do postdoctoral research at Harvard University and is an assistant professor at Florida International University, and Joseph Chen, who is now a postdoctoral fellow at the University of California, Berkeley. Roche, a Swiss pharmaceutical company, in 2015 acquired Berkeley -based Adheron Therapeutics, which had developed SDP051, a humanized monoclonal antibody that targets CHD-11, for use in patients with rheumatoid arthritis. Merryman’s team is partnering with Roche and testing the antibody on aortic cells in mice to see if it inhibits the damaging protein. In addition to CDH-11, Merryman’s laboratory has studied the potential therapeutic benefit of serotonin 2B antagonists. Typically, the serotonin 2B receptor is a target to avoid in drug development since some activation compounds, called agonists, actually lead to pulmonary hypertension and heart valve disease – for example, the deadly side effect of the weight loss drug Fen-Phen in the late 1990s. That was unexpected since Fen-Phen was meant to target the serotonin 2A receptor, but the similar 2B receptor that is abundant in the heart and lung caused the cells to go into overdrive when affected by Fen-Phen. Since 2008, Dr. Merryman has been examining serotonin 2B targeted drugs that inactivate the receptor – a class of drugs called antagonists – and these are showing immense promise against pulmonary hypertension, a disease that has no treatment and very poor prognosis. Merryman is also developing heart valves for children using inducible pluripotent stem cells – fully differentiated cells, such as skin cells that can be reprogrammed to act like embryonic stem cells. Pediatric heart specialists have been stymied in addressing birth defects and other problems in children’s heart valves because adult treatments don’t work well. Surgeons replace children’s valves with oversized ones from pigs – and when the patients outgrow those, there’s another surgery. The best option would be a tissue-engineered heart valve that would grow with the patient’s heart. However, the cells of the heart valve are unique and need to be coaxed into their specialized qualities in the laboratory before developing the valve. 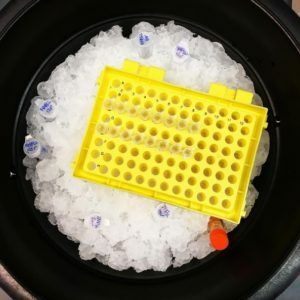 The R35 grant program is aimed at funding promising researchers instead of projects, allowing them to dive deeply into their fields over longer periods rather than spending precious time seeking funds for time-sensitive projects. On the second grant, Merryman is the sole engineer on a six-person, international team that received a $6 million Fondation Leducq grant to use sophisticated new technologies to examine the different non-myocyte cells in both normal and diseased hearts. The Merryman laboratory’s share of the grant is $700,000. The team also includes experts in the fields of cardiology, genetics and developmental biology from Harvard, the University of California, San Diego, and researchers from Germany and the UK.